The phenomenon of Christian Hebraism—that is, Christian interest in Jews and Jewish literature—dates back at least to Jerome (d. 419/420). Some Christian Hebraists, motivated by conversionary and polemical interests, wanted to convince Jews that a true understanding of Scripture would lead to their conversion to Christianity. Others sought to understand the culture of Jesus’ time. Such well-known scholars as Pico della Mirandola believed that the form of Jewish mysticism known as Kabbalah supported a belief in the Trinity, and Christian Kabbalah flourished during the Renaissance. Christian humanists, recognizing the antiquity of Judaism and its divine origin, studied Hebrew alongside the other classical languages of Latin and Greek. Interest in Hebrew continued to grow, and scholars produced polyglot Bibles with Hebrew, Aramaic, Latin, and Greek, often side by side. Attention was paid to the traditional Jewish understanding of the Bible. The King James version of the Bible was translated in England by Christian Hebraists. Johannes Buxtorf the Elder (1564-1629) was one of the greatest Christian Hebraists. His contributions ranged from Bible to rabbinics to what we today would call ethnography. Our Special Collections Department houses original editions of five of his works. In 1525, Daniel Bomberg printed in Venice the Rabbinic Bible, which included the Bible’s Hebrew text and Aramaic translation along with the work of a number of traditional Jewish commentators; this standard format is used by Jews to this day. Buxtorf edited the text of the Hebrew Bible and its Aramaic translations as well as the text of the Hebrew commentaries. His revised edition of the Rabbinic Bible, reprinted many times, made the traditional Jewish understanding of the Bible available to a wide variety of Christian writers. Its influence is noticeable in the works of John Milton and Isaac Newton. 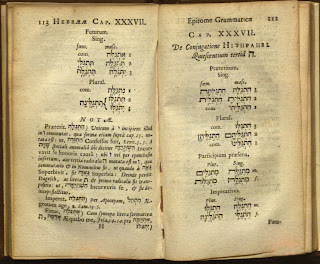 Buxtorf produced an important Hebrew grammar, the Thesaurus Grammaticus Linguae Sanctae Hebraeae. 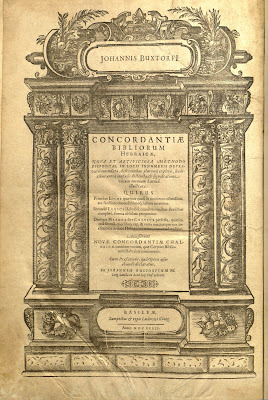 First printed in 1609, it was revised several times, with one edition produced by Buxtorf’s son, Johannes Buxtorf the Younger (1599-1664), also an important Hebrew scholar. The work, originally written in Latin, was translated into a number of vernacular languages and often appeared in abbreviated form, as in the grammar Epitome Grammaticus Linguae Sanctae Hebraeae. 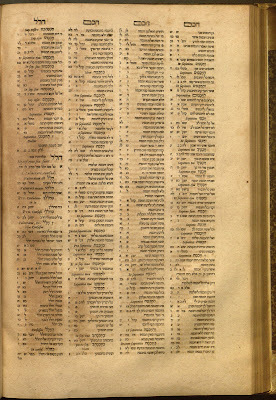 Buxtorf's guide to Biblical and Rabbinic Aramaic, Grammaticae Chaldaicae et Syriacae, made it possible to understand difficult rabbinic texts. It was an important resource for the average scholar, who would learn on his own or with a tutor. Buxtorf had his own Hebrew library. Knowing the importance of providing basic bibliographic guidance to others, he produced one of the earliest bibliographies of rabbinic literature—Biblioteca Rabbinica. This work was a major step in the development of more advanced bibliographies and its influence was felt for several centuries; it was of great value to Jewish scholars as well. Space does not allow a full listing of works written by Buxtorf. 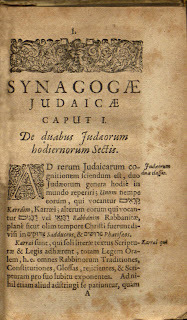 One work, however, stands out among the rest—Synagoga Judaica das ist Juden Schul, first published in German in 1603. It was later translated into Latin and other languages and also revised. The title of the English translation is The Jewish Synagogue, or an Historical Narration of the State of the Jewes [sic] At this Day Dispersed Over the Face of the Whole Earth, in which Their Religion, Manners, Sects, Death and Burial are Fully Delivered, and That out of Their Own Writers. This was not simply a work of ethnography. Buxtorf asserted that the source of Jewish religious authority, beliefs, and practice was not the teachings of Moses, but rather the teachings of the rabbis. Christians followed the Bible, the word of God. Jews followed the Talmud, which was full of errors, superstition, and hypocrisy. Buxtorf read widely and quoted frequently, giving his work an air of scholarship and accuracy. However, the information he presented was clearly biased and distorted. Although sometimes overt, the distortions were often subtle. In general, Jewish beliefs and practices were seen to be materialistic and superstitious. However, Buxtorf did believe that most Jewish practices were not offensive and that Jews were not a danger to Christians. Buxtorf was often quoted as an authority on Judaism and therefore had a profound influence on how Jews were understood in his time and the centuries that followed. He was fascinated by Jewish culture, yet even his great knowledge did not allow him to overcome many traditional prejudices about Judaism. Buxtorf did not include blatantly anti-Semitic fabrications such as the blood libel, though he did claim that Judaism was a distortion of the true biblical religion as found in Christianity. In his view, Judaisim was full of superstition and error and many of its rituals had shallow and materialistic goals. Despite these biases, Buxtorf made major strides in the understanding of Hebrew philology and in rabbinic bibliography. His works on the Bible made the text more accessible and his writings on Aramaic were of great importance in the understanding of rabbinic texts. Like many great scholars, he left a mixed legacy. 1. To access online versions of some of Buxtorf’s works and their translations, conduct the following author search in LOUIS, the Brandeis online catalog: Buxtorf, Johann, 1564-1629. Burnett, Stephen G. From Christian Hebraism to Jewish Studies: Johannes Buxtorf (1564-1629) and Hebrew Learning in the Seventeenth Century. Leiden, New York, Koln: E.J. Brill, 1996. Manuel, Frank E. The Broken Staff: Judaism through Christian Eyes. Cambridge, MA: Harvard University Press, 1992. 3. 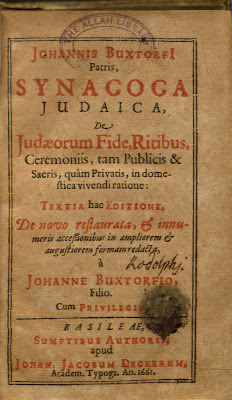 For a rejoinder to Buxtorf’s Synagoga Judaica, see Historia dei Riti Ebraici, Vita e Osservanze degli Hebrei di Questi Tempi by the great Italian Jewish scholar Leone Modena (1571-1648). The Brandeis library owns the 1707 edition of the English translation. This edition and an online version of the translation can be found in LOUIS by conducting the following search: Modena, Leone History of the Present Jews Throughout the World.